It’s very important to control the oil temperature to enjoy driving. Extreme increases in oil temperature can break down the oil and decreases its ability to lubricate, cool and clean the engine and can cause damage as a result. 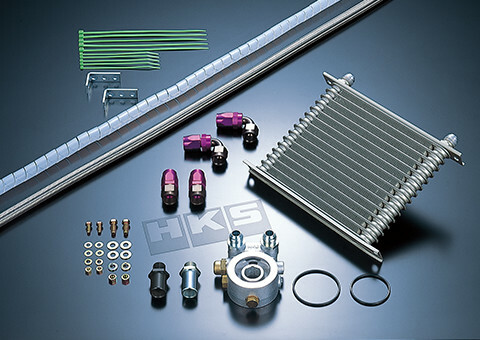 HKS Oil Cooler Kits are designed with advanced cooling technology which enables stable oil temperatures to extract the maximum ability from the engine. Optimum size of the core and layout design improves cooling performance. With the use of a new core, both cooling and pressure drop prevention are balanced at a high level. Some vehicle applications contain air guides which maximize the air flow through the oil cooler core during vehicle operation, even in drifting applications where the car may not be facing in the direction it is pointing. * Some kits are the factory replacement type. Two types of kits are available with R Type kits: filter relocation type and S Type: sandwich type which is held at the oil filter. HKS Oil Coolers use high performance cooling cores; so there is the possibility of overcooling which is prevented by the use of a thermostat (some vehicles excluded). 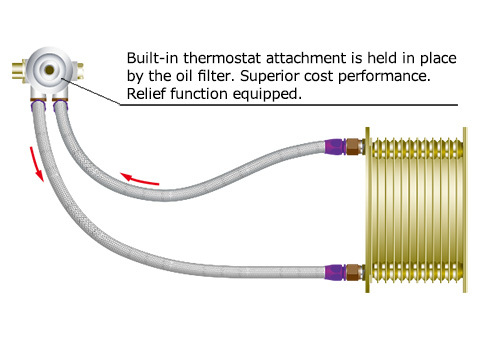 This thermostat has high response and able to react quickly to change of oil temperature. Once oil temperature reaches the set level, the oil will flow through the cooler core but bypasses when temperatures drop lower. This allows engine oil to be maintained at the ideal temperature. Hose lengths and fitting types are tailored to each vehicle application to ensure easy and tidy fitting while preventing connection errors. 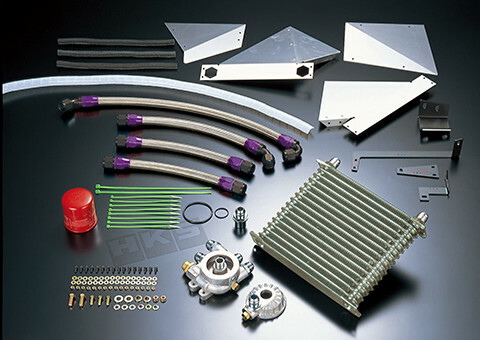 HKS Oil Cooler kit R Type is a filter relocation type for strict control of oil condition. The core on the above photo is different from the actual core included in a kit. Installing the attachment to the factory oil filter’s position and relocating the filter require only minimum maintenance. HKS Oil Cooler R Type can relocate the location of an oil filter so the oil filter replacement can be easily done. As remarkable difference from the others, thermostat is activated by temperature of the oil flow out of the engine, that allows engine oil to be maintained at the ideal temperature. This thermostat has high response and relief feature which activates when differential pressure exceeds 200kPa (2.0kgf/cm2). 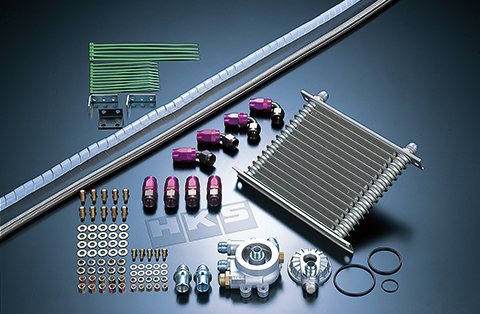 HKS Oil Cooler Kit S Type is a sandwich type which has a built-in thermostat attachment. HKS Oil Cooler S Type included a built-in thermostat attachment, and which is held in place by the oil filter. Minimum number of components allows simple installation. 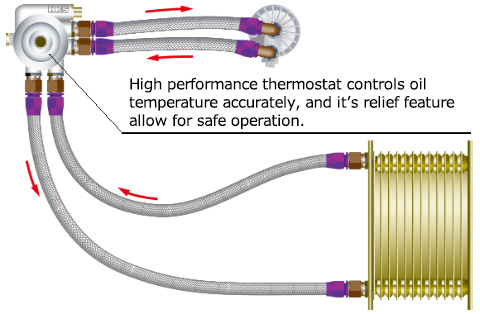 HKS Oil Cooler S Type includes a built-in thermostat attachment, and which is held in place by the oil filter. Also, it provides superior cost performance.